An exciting, thrilling, complete western romance novel. Joanna was the epitome of a southern girl - beautiful, curvy, and as sweet as cherry pie. She always remained positive and happy, even without having much time outside of her work life. With little luck dating, Joanna decided to sign up for an email-order-bride service, thinking little of it. Awaiting her arrival was John, a handsome, muscular hunk with a stellar ranch. Will love find course through old methods? Or will they be forced to walk separate paths alone?! Warning: Listeners should be 18 years of age or over due to mature content and language. This was a very short and sweet old fashioned romance. While the story and characters didn’t have much depth, it did have a happily ever after. The characters were likable and the setting seemed beautiful from the description. Zura did a really great job narrating this book. I love the different voices that she gave each character and the transition between them was flawless. She really put herself into each character to bring them and the story to life. This short book is packed with everything needed for a good novel. Never underestimate a short story. I was provided a free copy of this audible at my request, I'm happy to leave my review. This was a cute story about finding love in a nontraditional way. I enjoyed the acting on the ranch. The narration for this was very good as well. I really like the concept of a mail order bride for a rancher/cowboy. Especially if he's a millionaire. Unfortunately, this fell a little short of the story line. Yes, that's how they meet but he comes across asking if she wants to work at the ranch instead of date or get married. You know what the website is for and why you were looking for it, so why the change of heart? And I was also puzzled about the type of ranch and how he made his money. Just felt like it was missing the romance and more focused on acting. I read romance books to hear about the couple fitting and getting to know one another. The narrator did a great job of going at an excellent pace and giving each character a distinct voice. I was given this audiobook by my request in exchange for an honest review by Audiobook Boom. I received a copy of this book in exchange for my honest review. Normally, I would not write a review for a book I disliked so much, but I said that I would. So, here we are. The only good thing was that it was short. Not sure I could have dealt with a couple more hours of this. There was zero chemistry between the hero and heroine, although they kept talking about how they fit so well, you could not tell. They meet on a mail order bride website. He is a billionaire who is lonely and is not attracted to the model types who work on his living ranch. She is curvy and has the body he is interested, but it is her acting that attracts him. She comes out and feels at home, but gets upset when he is not coming through with the proposal. He has a best friend who is a girl who is very sick, they talk about her likely dying, but never explain what she is sick with. Joanna, the heroine freaks out that he might like his best friend and dumps him. He then realizes that he can’t live without her. But nowhere is there any angst or actual feelings. We are just told that there are. I did not figure out that this is a christian romance until we get to the wedding scene and the vows are recited in more detail than literally anything else In the book. The whole father son and the Holy Spirit and Jesus kit. Then the best friend gets married and she is gorgeous in her dress although she was recently dying and going for experimental therapy. Ummmm, is she no longer sick???? Anyway, I would never have gotten through this book if I did not promise that I would and it was short. John is a billionaire who invested money in a dude ranch with actors playing western roles with his friend, He is lonely and fears meeting women who only want his money or can’t meet any at all. Reluctantly he tries a site for brides and meets Joanna..who is an actress and comes out to try out to work at the ranch. Cold feet, inability to express feelings...sweet romance..just nothing great...also no military in this book. Narrator did a nice job and didn’t make me quit listening but not great. 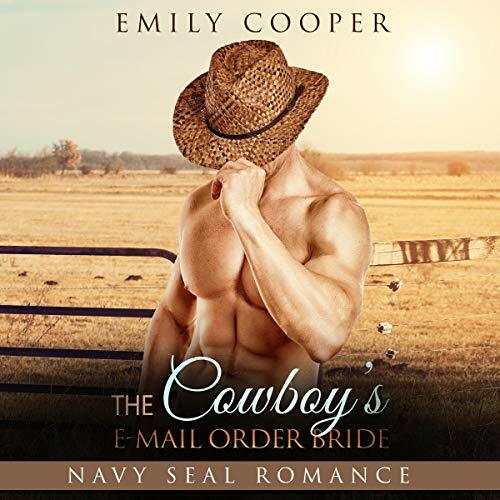 The Cowboy's E-Mail Order Bride: Navy Seal Romance was a good read by Emily Cooper. Joanna decided to sign up for an email-order-bride service due to her little luck in dating. John is a rancher who is awaiting her arrival. I enjoyed reading Joanna and John's story and can't wait to read more by Emily Cooper. This short is an entertaining listen!. Gavin and John own a vacation spot where you can go and live in a the world of the old west. John is lonely and ready for marriage, so through an email order bride, he meets Joanna. Joanna is an actress and is hoping not only to land a part, but find her happily ever after. Will the spark be there when these two meet? I thought this was a good listen, but would have benefited from being a little longer to develop the story a little further. The concept of the vacation spot is very interesting and John and Joanna are both worth getting to know! It's a fun, sweet, clean romance. Zura Johnson gives a good narration and keeps the flow moving. If you enjoy mail order bride stories, give this one a try.